Just easing into this afternoon. My sister and her friends are out picking up the fourth for their cruise which starts tomorrow. This chick came all the way from her US Embassy job in China for this vacation. China --> La Guardia --> Miami, a full day of travel. This trip better rock for that effort! 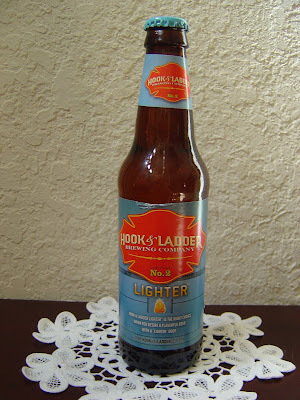 I've had Hook & Ladder Lighter sitting around for a few months, so I think it's time to drink up. This beer was brewed by Hook & Ladder Brewing Company in Rochester, New York. The label says this beer "is the right choice when you desire a flavorful beer with a "lighter" body". They are clearly going for a light beer here as they even put the nutritional analysis on the label. Wow, 94 calories! The label also says they make a donation to a local burn foundation for every barrel they sell, which is awesome. Grainy corn, sweet aroma. Very lemony flavors to start. Grainy corn and dirty. There is also an unidentifiable weird, but if I must say what it is, well, it's wet socks. Small hops add a pleasant bitterness, but the very thin flavors and weak body are not that enticing. Not horrible and it is drinkable, but I'll find something else every time!